A valid credit card is required at the time of booking to secure the booking. A minimum deposit equal to 1 night per room will be charged at time of booking. If you prefer deposit option is available for full amount of booking. (Additional nights, add on & other items to be paid during your stay unless you choose the Full Payment when making booking). Advance Purchase bookings are a NO CANCELLATION NO REFUND policy, therefore full amount of booking will be forfeited. Add On selected no refund or cancellation permitted after arrival date of booking. Person making the booking must be 18 years old or over. Minimum 1 nights accommodation rate will be charged to the credit card at the time of booking. If you prefer deposit option is available for full amount of booking. Add on & other items & additional accommodation charges to be paid at the hotel during your stay unless you choose the Full Payment when making booking. Advance Purchase bookings require full payment at time of booking. Child over 17 is considered as adult. Child aged 2 and under is free. If no cancellation has been made and you fail to show up at the property, we will charge a one night room charge for number of rooms booked. Advance Purchase bookings are a NO CANCELLATION NO REFUND policy, therefore full amount of booking will be forfeited. A Credit Card BELONGING TO THE RESERVATION HOLDER MUST be presented for authorisation on arrival. Credit Card holder must be the registered guest. A pre-authorisation of $50 minimum plus outstanding accommodation charges, will be processed on the credit card at check-in. Pre-authorisations amounts are set aside by the credit card company for up to 14 days and will temporarily affect your available funds balance or spending limit. No parties & visitors policy. The number of guests gathered in the apartment overnight (ie after 10pm until 9am must not exceed the number of persons booked). Any persons exceeding this number will be considered as trespassers. Noise must be kept to a minimum level at all times. If any noise complaints are received from the neighboring residents you will be asked to leave the premises immediately. Your accommodation tariff will not be refunded, security deposit may not be refunded. The registered guest will be held financially responsible for any loss or damage caused during his/her stay. 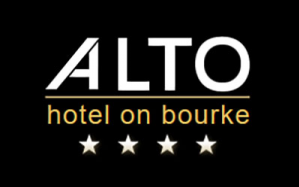 Copyright © Alto Hotel On Bourke All Rights Reserved.